Nice! How and where to download it comrade? The same method, go to your library in Steam > right click on SQUAD > Properties > Beta and insert the code. Now, a second game will show on your library that doesn't change the original files. Amazing. Now we can play both versions without uninstalling and installing over and over again! Community-hosted servers should be available. Simply fire up Steam, navigate to Library, and find Squad - Public Testing. It should appear as its own entry now. After that, download (WARNING: IT IS A COMPLETELY SEPARATE SQUAD INSTALLATION) away and get your game on. If it doesn't start downloading, try restarting Steam. 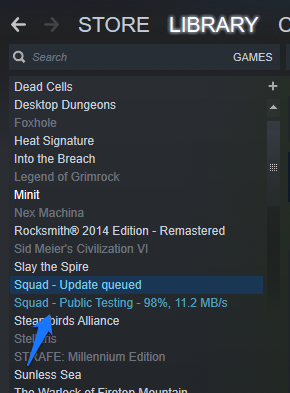 Strange, for me "Squad - Public Testing" was not in my library until I inserted the code. So nice not to have to delete old version. there is no code read the post! Honestly why even remove it, was it hurting people, was it in the way for coding the new tanks, Have players complained that it was there? Great idea to separate the different builds! I don't recommend having the server messages and enemy chat text color in the same red. Scoreboard now shows which fireteam your squad members are in. Skirmish layers have received an update, and so did Chora layers. Russian desert ammo bag texture got fixed. Fixed a crash on map change. Fixed fully load textures being on by default. Trying to use the Squad - Public Test Dedicated Server on Linux (AppID 774961) but it's showing up in the Custom Server list as v11 and the last update to the public branch was 6 months ago. There's a community-host branch updated 2 hours ago but it has a password. New update 1.3GB on SQUAD - Public Testing but no servers, why?